How to Easily Master Format MOTOROLA MOTO E / MOTO E DUAL (XT1021 / XT1022 / XT1025) with Safety Hard Reset? Solutions to fix problems at MOTOROLA MOTO E / MOTO E DUAL (XT1021 / XT1022 / XT1025). The Motorola smartphone become more interesting to buy since Google bought this mobile company. Like other Google’s own smartphone, usually it will get latest update to the Android operating system, like Nexus Android smartphone. Why should we choose Motorola Moto E? Because this is low budget smartphone but have ability to get Android update later. Not like other cheap smartphone which can not get any update when Android release new firmware version, MOTOROLA MOTO E / MOTO E DUAL (XT1021 / XT1022 / XT1025) already use Android Kitkat at the first time release, and will also get latest Android Kitkat update or also Android Lollipop will be release for MOTOROLA MOTO E / MOTO E DUAL (XT1021 / XT1022 / XT1025). We can choose two options whether single or double simcard slot, all the specifications are same. How to Fix or Problem Solving for Recovery MOTOROLA MOTO E / MOTO E DUAL (XT1021 / XT1022 / XT1025) hang or not responding or malfunctions or stuck or freezing or bricked ? Android smartphone will be talk about many applications that we can use at this smartphone. Motorola already include some factory default applications. For fit our need, we still can download more apps from Google Play Store. But we have to understand that some applications maybe not always compatible with MOTOROLA MOTO E / MOTO E DUAL (XT1021 / XT1022 / XT1025) or sometime the applications itself are created to make our phone become problems like virus applications or something like that. If this problem happen, then our MOTOROLA MOTO E / MOTO E DUAL (XT1021 / XT1022 / XT1025) will get trouble like hang or bricks or broken or blank or stuck or boot logo loop or LCD touch screen not responding. When we get this problem, then we have to force shutdown or force soft reset or reboot or restart MOTOROLA MOTO E / MOTO E DUAL (XT1021 / XT1022 / XT1025) to clean factory default or cache. If the problem still happen, then we should do hard reset or master format. How to Force Shutdown or Force Soft Reset or Reboot or Restart MOTOROLA MOTO E / MOTO E DUAL (XT1021 / XT1022 / XT1025) ? Not like other cheap or low end Android smartphone, the MOTOROLA MOTO E battery are not removable, so we can not open the battery when our phone get trouble or stuck or LCD touch screen not responsive with our finger touch. Then How to force shutdown or force soft reset MOTOROLA MOTO E / MOTO E DUAL? We need to press and hold POWER button several seconds until the phone shutdown by itself. Wait until the phone completely off then press again POWER button to turn on. We already done soft reset process. If our phone still can not normally, we also can do soft reset or reboot or restart by press and hold POWER button until pop-up menu appear, after that choose Shutdown / Reboot / Power Off to do soft reset. Please note, this soft reset or reboot process is safe to do anytime, because it will not remove any important data or installed applications. How to Restore and Reinstall Clean Android Operating system / firmware at MOTOROLA MOTO E / MOTO E DUAL (XT1021 / XT1022 / XT1025) (reformat) ? There are many applications that we can install from Google Play Store. We can choose what we want to use and also some of them have their own setting for fit to what we need. However, sometimes the problems come because installed applications or wrong setting that can make the operating system damage or broken or corrupt. If this problem happen, we need to do reinstall or restore clean factory default Android operating system to make it run normally again. The important think that we have to know is about the file source of operating system already save safely inside MOTOROLA MOTO E / MOTO E DUAL (XT1021 / XT1022 / XT1025) ROM. Therefore we do not need to copy or connect from other device. Just follow the steps to hard reset above then the operating system of MOTOROLA MOTO E / MOTO E DUAL (XT1021 / XT1022 / XT1025) will be reinstall automatically. Please remember to do backup before performing reinstall or reformat or hard reset, because all important data can be removed or wipe from this phone. How to Unlock or Fix or Bypass or Solutions for MOTOROLA MOTO E / MOTO E DUAL (XT1021 / XT1022 / XT1025) forgot password code or security lock screen pattern or pin (lost password)? We need to protect our important or confidential data inside our phone. That is why we are suggest all Android user to give security protection. There are some options that already included at our MOTOROLA MOTO E / MOTO E DUAL (XT1021 / XT1022 / XT1025) for security protection, but usually we recommended to use screen lock protection because it is easy to use. Some users also like to have password pin protection or other security options. The problem happen when we forget the answer of our security protection. However, Google already prepare for forgot security screen lock pattern or password pin protection at MOTOROLA MOTO E / MOTO E DUAL (XT1021 / XT1022 / XT1025) by using Google account or Gmail username and password. Please give several wrong answer continuously until the phone freeze or locked about 30 seconds. At this time we will find field to give our Google account username and password that we have already signed in before. Please make sure we have already activate our Internet connection. If we can not access Google account then we have to do hard reset or master format MOTOROLA MOTO E / MOTO E DUAL (XT1021 / XT1022 / XT1025). How to Improve Performance MOTOROLA MOTO E / MOTO E DUAL (XT1021 / XT1022 / XT1025) to make run more faster? Motorola Moto E is the cheapest or low end product for new Android Motorola Moto family. The one step above Motorola Moto E is Moto G. The MOTOROLA MOTO E / MOTO E DUAL (XT1021 / XT1022 / XT1025) have 4.3 inches LCD screen and use dual core Qualcomm processor at 1.2 Ghz clock speed. For internal memory it have 4 GB and powered with 1 GB RAM. For daily activity like chatting and social media Whatsapp or LINE or BBM or WeChat or Facebook or Tweeter or browsing or open&work documents or playing some games, this Android specification already enough to run for that. But some users get slow problem after use this phone several months.Usually this problem happen because there are too many applications run together that make the RAM become insufficient. Some applications that we download from Google Play Store will keep run in the background without any notification for wait the data update or wait some command. All applications need RAM and processor resources to run, therefore if there are too many apps run in the background and foreground then the RAM will be insufficient and need to release some not use application for give more RAM space for new running applications. This steps will make our MOTOROLA MOTO E / MOTO E DUAL (XT1021 / XT1022 / XT1025) become run slowly then usual. Please remove or uninstall some not use applications. If we want to make speed improvement for MOTOROLA MOTO E / MOTO E DUAL (XT1021 / XT1022 / XT1025) performance to running more faster then we have to consider doing hard reset or master format. Is That Any Secret Code for Doing Format MOTOROLA MOTO E / MOTO E DUAL (XT1021 / XT1022 / XT1025) ? There is no secret hidden code for MOTOROLA MOTO E / MOTO E DUAL (XT1021 / XT1022 / XT1025) to make it back to factory default. Do the options above to hard reset it. How to Upgrade MOTOROLA MOTO E / MOTO E DUAL (XT1021 / XT1022 / XT1025) to Android ver.5 Lollipop? The Android Lollipop version will be updated steps by steps for MOTOROLA MOTO E / MOTO E DUAL (XT1021 / XT1022 / XT1025) users, but we still not get exact date to update, usually the update will be release gradually base by country. Please find the latest update from Setting > About phone > Software update. [A] Hi, maybe your Motorola Moto E got software trouble. Therefore you should do hard reset using hardware button combination key like steps at #option 2 above to reformat your Motorola Moto E operating system to factory default. [A] Hi, unfortunately when you do hard reset with low power battery, then your Motorola will corrupt in the middle of re-flashing. Please ask help at Motorola authorized service center, they may help to reflash with computer software. The information from this page describe about Hard reset motorola xt1021,motorola xt1022 hard reset,motorola handy reset,when moto e2 software correpted then how instal that. If you need another resource for hard reset, use search function at this homepage or find from our related posts. How to Easily Master Format ASUS ZENFONE GO ZB500KL with Safety Hard Reset? Hi, if that steps does not work, then please skip that steps. After you see recovery menu at Motorola Moto E LCD screen then you can directly navigate directly using Volume Up and Volume Down and press POWER button to select or OK. Then your Motorola Motor E operating system will be reinstall by itself, wait until this phone booting normally and ready to re-setup again from beginning. Please make sure your Motorola Moto E battery is not empty while doing hard reset. 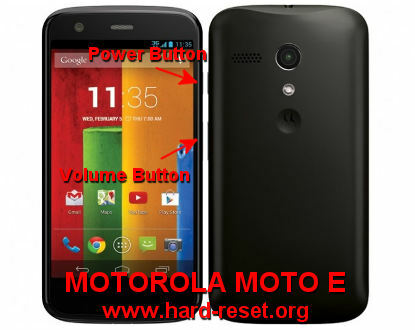 Hi, please do hard reset your Motorola Moto E using hardware button combination key like steps at #Options 2 above. Hi, if you mean your Motorola Moto E has been done hard reset, but your simcard is not accepting Google account, then please note that Google account usually does not filter with specific simcard network provider. Please try to connect with secure Wifi connection near your place, then try to sign-in again with your Google account, after you have done connect with Google account, then please try to deactivate the wifi connection, then continue with test your Internet connection using simcard provider at your Motorola Moto E.
Hi, if you get Android Logo lying down, then please try to press Power and Volume Up button together. black screen after logo.Hard reset try but doesnt working. also tried fastboot and adb stuff but doesnt work. Hi, usually the steps at #option 2 above can make your Motorola Moto E go to recovery mode and you can find Wipe Data or reformat the operating system menu. But this steps may not work for some custom rom or any rooted Motorola Moto E. Therefore you have to discuss with Motorola authorize service center. I can still see the “No command” error after doing everything. After downloading the software update “Lollipop” the phone restarted and since then it is showing “No Command”. I have done factory reset, erase wipe etc. Kindly help. Hi, as far as you upgrade with official OTA firmware update, then your Motorolo Moto E will be run especially after you have done factory reset because all installed applications will be restore back to default new firmware. If still can not work, then maybe your Motorola Moto E get custom rom or any rooted tweak. Please consult with Motorola authorize service center. Hi, please try to do hard reset one more time using hardware button combination key like steps at #option 2 above. After finish reformat the operating system of your Motorolo Moto E, then please change the Language to menu Setting. The default will use English language version. Hi, this conditions usually happen because your phone get interrupted while doing OTA update. Please bring to Motorola authorize service center, they will give solutions to reflash with proper operating system at your Motorola Moto E.
Hi, unfortunately when you do hard reset with low power battery, then your Motorola will corrupt in the middle of re-flashing. Please ask help at Motorola authorized service center, they may help to reflash with computer software. Hi, maybe your Motorola Moto E got software trouble. Therefore you should do hard reset using hardware button combination key like steps at #option 2 above to reformat your Motorola Moto E operating system to factory default.